This is definitely the time of the year when you are receiving a number of gift cards. Aunts, uncles, grandparents, the spouse, co-workers and the neighbors are all plying you with gift cards. Do you really want to carry all of them in your wallet or purse? Well, if they were issued by one of the 50 retailers that has partnered with Samsung, you can store them digitally on the Samsung Pay app. Storing and using gift cards is a feature that is not yet available on Apple Pay. In the same manner that you would use to store a credit or debit card on Sammy's mobile payment service, certain gift cards can be kept on your handset. When you are ready to use the gift card, you can select it from your digital wallet and complete a transaction by using an NFC connection, or via MST (Magnetic Secure Transmission). 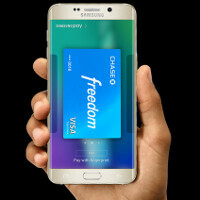 The latter allows Samsung Pay to work at any retailer that can swipe a credit card. Among the retailers whose gift cards are supported by Samsung Pay are Babies"R"Us and Toys"R"Us, Bass Pro Shops, Domino’s, eBay, GameStop, Nike, Regal Entertainment Group and Staples. And you can even purchase new gift cards from select retailers inside the Samsung Pay app. That is the easiest way to finish off your holiday shopping list. Samsung Pay has launched in the U.S. and South Korea. Three countries rumored to be receiving the mobile payment service next quarter are China, Spain and the U.K. The handsets that are compatible with Samsung Pay are the Samsung Galaxy S6, Samsung Galaxy S6 edge, Samsung Galaxy S6 edge+, Samsung Galaxy S6 Active and the Samsung Galaxy Note 5. Need another look at the Galaxy Note 5? We've added some images below, just for you! Used it yesterday at Subway, worked flawlessly. I liked that I didn't have to turn NFC on either. It is pretty boss. NFC payment has a long way to go. I love how Apple, Google, and Samsung are giving it a huge push. It's got a bright future. Hopefully apples beacon-type program takes off with other manufacturers. I'd love me some targeted discounts based on position in the store. Man i'm so jealous, cuz bot nfc payment won't happening anytime soon in Indonesia. What's going on there, that it's not happening? "Third-world" problems Darkk, and that credit card adoption is still low here. Understood bro. Hope it gets better. Yea thank you, to be honest there still so much thing to improve here including stable 3G/4G connection & our government even consider a smartphone as luxury stuff and intends to raise taxes for a smartphone while there are others things need to be fixed. I still carry a card as backup, usually my Amex. I have stumbled on a few issues. Like for example, at Target I can use the card and it works at the cashier, but it doesn't work over at the counter where they have the pizza. Gone rito a few small restaurants where it didn't work. Also when I went to Cracker Barrel it didn't work their either. I only frequent Target so the others are no big deal. The only time it has failed on me is at one restaurant one time. Then tried again with a different card and it went through. For some reason that restaurant wouldnt run my debit card through samsung pay, but it would take other cards throught samsung pay. Thought that was a little odd. other than that. Works at any other restaurant I've been. Coffee bean where I get my daily coffee, stores at the mall. Target, pizza stores. 7eleven. etc. What do you do at restaurants, give the waitress your phone? There are still many instances I can think of where I need a card. Some restaurants have the tablets on your table where you can order your food and even play games (such as Chilis, Applebees, Olive Garden and Red Robin). They have built-in swipe card readers so you can pay for you bill at the table. Other restaurants I have walked with the server to the swipe terminal with them and paid at the terminal. Storing and using gift cards is a feature that is not yet available on Apple Pay. WAAAAAA?!! Samsung Pay. I love using it. The looks I get when they say it won't work and it does. No Galaxy regrets! Some places are apparently blocking it. It reads the card but declines it at Home Depot. It's worked for me at Wal-Mart for small balances, but just yesterday it declined over $50 (the level at which Wal-Mart requires a signature). Used the card it was linked to with no problem. At home depot I ways go to the self check and it always works there. But sometimes it won't at the cashier. So I stop going to the cashier. I noticed the terminals at the self checkout are different than the ones at the register. Yup, although I'm glad all the banks I use are now supported (AMEX, BofA, Citi and now Chase). Samsung basically worked in the reverse as Apple and Android Pay: they got more business to support it (indirectly via MST and NFC support) first before getting the bank support. I think by getting the MST support (along with NFC) it is used much more than Apple/Android Pay because I can use it at almost every place that takes CC. It'll be at least a few years to get merchants to upgrade to new terminals so Samsung Pay will continue to be used a lot more than the other 2 payment systems because they can only be used with NFC.